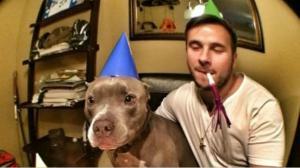 Burberry celebrating his 5th birthday with his person and some bacon, as shown on the NBC San Diego website. Two San Diego police officers responding to a domestic disturbance call at 5am Sunday reportedly knocked on the door of the wrong house. Resident Ian Anderson was awakened by the knocking as was his 6 year old service dog who began barking. The dog, called Burberry, can be seen on surveillance video approaching the first officer who pets him in greeting. Burberry then exuberantly approaches the second officer who was reportedly screaming at the dog for reasons unknown. The second officer pulls out his gun and, out of camera view, shoots Burberry in the head, killing him while his owner watches in horror. 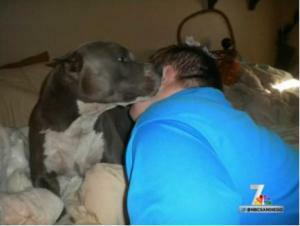 Burberry cuddling with a friend, as shown on the NBC San Diego website.